The best-kept secret in the Lakes Region is Lake Wicwas, known as Wickwas Lake to many. Lake Wicwas is a medium-sized body of water with sensational views of the surrounding mountains, several islands, and lush surrounding forestry. Many families choose Lake Winnipesaukee because of its sheer size, but there are dozens of other options in the area that are picture-perfect for a summertime family vacation – Lovely Waterfront Home is no exception. This cottage is one of our favorite New Hampshire lake rentals, mainly because of its jaw-dropping lake views, charming interior, and splendid on-site amenities, such as its gas grill, walkout balcony, and private boat dock. The splendid view from the dock, as you can see in the photo, is a popular spot on a leisurely afternoon or around dusk! If you’re searching for a mid-summer week-long vacation home in the heart of the Lakes Region that can accommodate up to 14 guests, look no further than Evergreen Lane Waterfront on Lake Winnipesaukee. Evergreen Lane is the perfect combination of luxury, waterfront convenience, and jaw-dropping natural beauty (as seen in the photo above). This colonial cottage rests on the edge of a dazzling metamorphic rock wall near the water’s edge. Start each morning with a steaming cup of fresh-brewed coffee at dawn on your private deck, explore Lake Winnipesaukee via kayak in the late morning, and try jet-skiing after a hearty lunch. Gather for dinner, drinks, and fireside stories as the day’s last light disappears below the horizon. Not many New Hampshire lake rentals can match Pemigewasset Lake Waterfront’s combination of laid-back luxury and jaw-dropping beauty. This cottage has become one of our most popular lake homes over the years. Spend several hours per day splashing, fishing, and canoeing on serene Pemigewasset Lake near this four-bedroom cottage. You’ll also be minutes away from the area’s best hiking trails, four-star dining, and eclectic shopping. 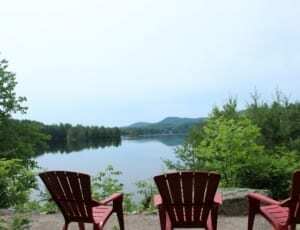 There are several outdoor seating areas with differing views of tranquil Pemigewasset Lake, which is equally quiet and beautiful. Paddle through the still water at dusk, soak in a relaxing jetted tub, and enjoy a late-night waterfront campfire before retiring for the evening. 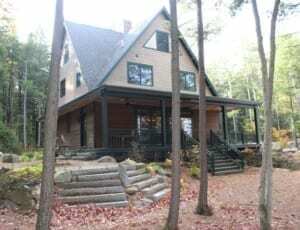 To browse through our entire collection of Lake Winnipesaukee real estate and New Hampshire vacation rentals, please visit us online at BaysideRentalsNH.com.